March Madness not only provides us with some amazing basketball but it also entertains SXSW in Austin, Texas. For the past 4-5 years you can expect Mark Spratley (Sprat) to invade SXSW and takeover with star studded lineups, major media partners, vibes and surprises. 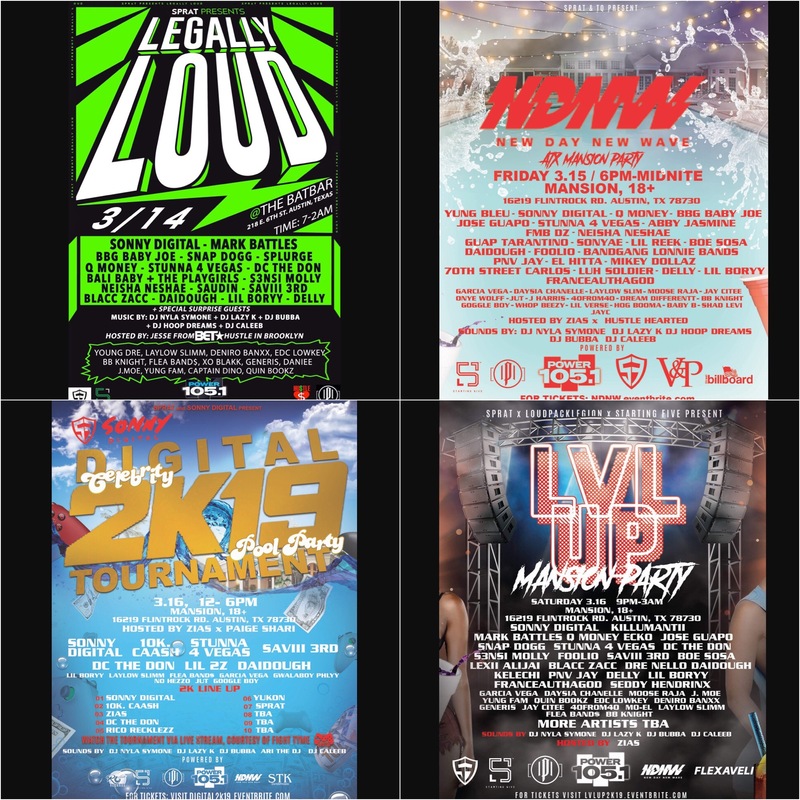 This year is no different as Sprat sets out to turn up SXSW one more time with a week full of events that include Legally Loud, New Day New Wave, The LVLUP mansion party and a Sonny Digital partnered celebrity NBA2K tournament + mansion pool party. Often breaking out the next music star on his stages, this is an event you want to attend and a platform any artist should strive to perform on. Sprat returns this year as he recruits Yung Bleu, Sonny Digital, Killumantii, 10.Caash, Mark Battles, BBG Baby Joe, Splurge, Saudin, Snap Dogg, Q Money, Ecko, Stunna 4 Vegas, Abby Jasmine, Saviii 3rd, BOE Sosa, Lexii Alijai, Foolio, DaiDough and many more stars for quite a crazy week. With Power 105.1 NY as his official media partner going into the week, Sprat has compiled quite a wave and schedule of events for yet another year. Year in and year out you can expect Mark Spratley to provide some of the best stages and largest and most coveted mansion parties during SXSW. We took some time out to highlight the mogul and his schedule for March 14-17th 2019. Check out Sprat on Twitter/Instagram @SpratFool for all updates and details.